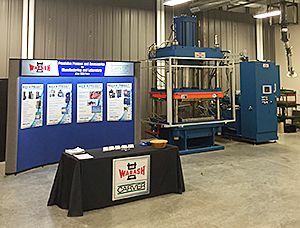 A Wabash MPI composite molding press is part of the new collaborative research facility at Purdue University. A versatile down-acting 250 ton composite molding press with 42” by 42” heated platens (up to 1000 degrees) and cooled platens from Wabash was installed in at the Indiana Manufacturing Institute. This press will help Purdue University develop next-generation composite molding compounds for the LNG, Wind Power and Automotive Industries. The West Lafayette, Indiana facility allows for collaboration of educational resources and research.